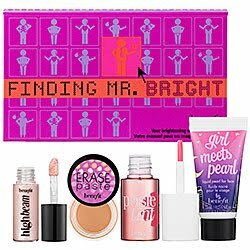 love,love,love this four-piece kit from benefit! its the perfect antidote to get your makeup regime out of winter hibernation *insert harps and angels singing*. it includes the perfect combo of skin-brightening, dewy skin assistants, appear like you swallowed a light bulb illuminating products. your luminous complexion will thank the two luminizers, a poppy-pink tinted lip and cheek stain, the ideal concealer, and a step-by-step brightening lesson that complete the kit.